Exploring UNESCO World Heritage Sites has become something of a trend in our family over the past few years. It’s something I’ve always done, albeit sometimes without realising, particularly when much younger, but now it’s something we actively seek out when travelling. These sites have undergone a rigorous application process to gain their prestigious UNESCO World Heritage status and we want to see why. 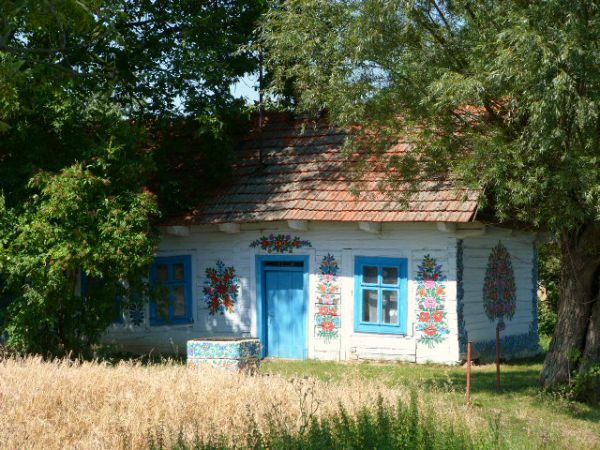 Sites can be natural or manmade but not all are beautiful for the premise of the listing is that the place must be of special cultural or physical significance. This means there are industrial sites, as well as sublimely beautiful natural sites and of course gorgeous buildings/monuments, and there are a huge amount of them: 1052 at time of writing, spread across 165 countries. Clearly visiting them all would be a gargantuan task and one that I am unlikely to achieve, but there’s no harm in breaking it down to more realistic goals such as getting to all those in France…. 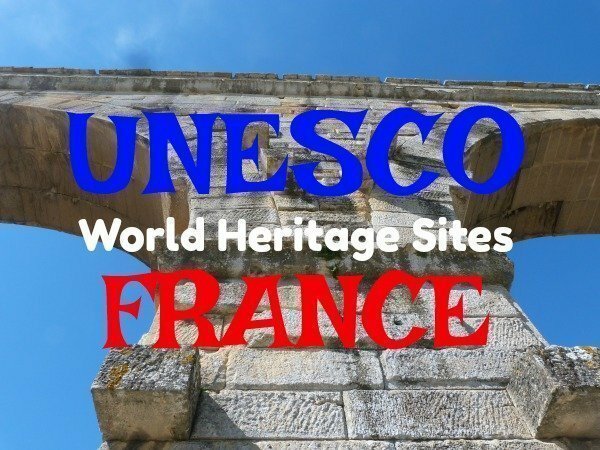 Currently there are 42 UNESCO World Heritage sites in France, which puts it in 4th place after Italy, China and Spain. 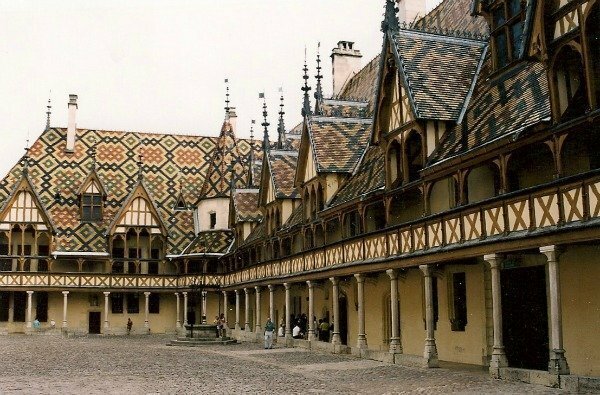 The list began in 1978 with 12 sites and the first places in France to achieve heritage status were Chartres Cathedral, Mont St Michel, Versailles and Vézelay all added a year later in 1979. The most recent additions to the list in France have been the Champagne Hillsides, Houses and Cellars (2015), The Climats, terroirs of Burgundy (2015) and in 2016 the architectural work of Le Corbusier (shared with other countries). As much for my own records as anything I have put together a list of those sites I’ve been to in France and it appears it numbers 23, although three are rather tenuous. 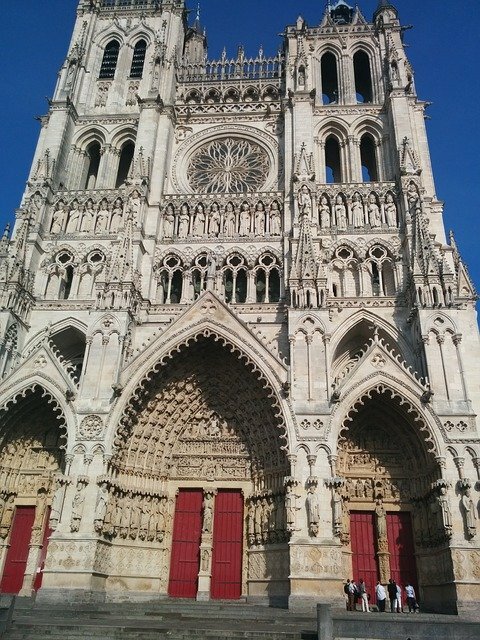 I’m ashamed to admit that although I’ve driven past Chartres on the motorway several times, from where you can see the Cathedral, I’ve never actually stopped to visit. I don’t count it in my list though I do count the Nord-Pas-de-Calais Mining Basin (tentatively) as I’ve driven through it more times than I can count. I won’t go into historical or cultural detail here, rather just a few words about personal experiences relating to each site. All photos are my own (unless specified) and many of them date from pre-digital days, please excuse their archaic quality. Let’s go…. 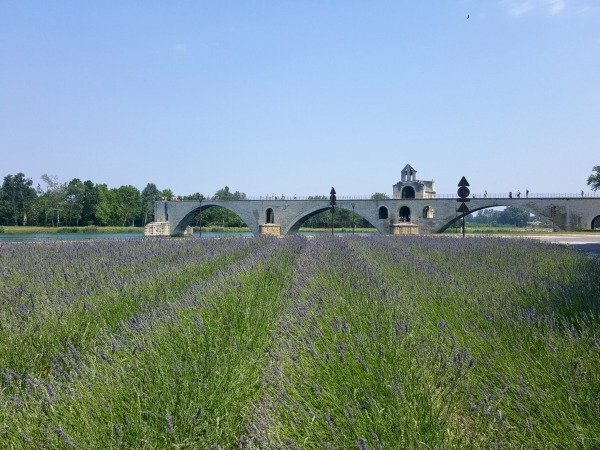 Arles, on the edge of the Camargue, is a gorgeous town to visit, associated with Van Gogh and bursting with culture. We took the little kid there a few years ago to see the Roman arena and being into gladiators at the time he loved it! I know I’ve been to Amiens Cathedral several years ago, but have no photographic evidence, so this photo is from Pixabay. We visited having stopped for lunch on the way to the Baie de Somme. Having had the misfortune to live in Calais in the late 1990s, a pretty awful place to live even before the horrors of The Jungle, JF and I have seen many of the belfries of northern France and Belgium. 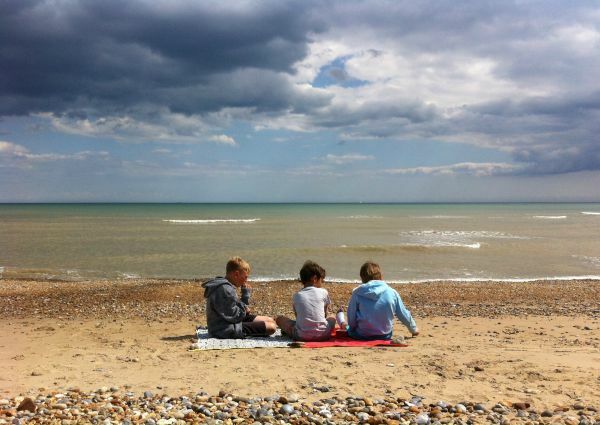 The best thing about living in Calais was getting out of it – its location was great for exploring the north of France, Belgium, Holland and even quick trips to England. 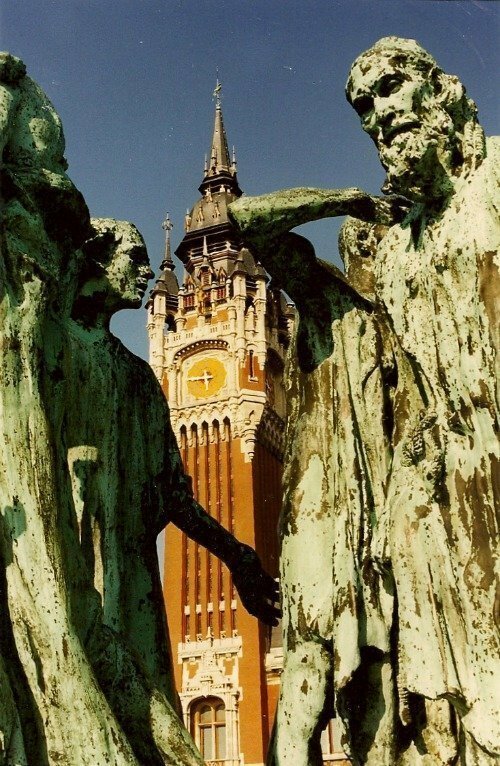 This photo is of the belfry in Calais with Rodin’s sculpture “The Burghers of Calais” in the foreground. In the summer of 1981 my family rented a boat with some American friends for a week on the Canal du Midi. I remember many details about this trip, such as going through locks and drifting along under the shady plane trees, but the most memorable thing about this particular holiday was a royal wedding. We were on board when Charles and Diana got married and our American friends were obsessed with the wedding. Obviously this was way before the internet and 24 hour news coverage so we were amazed to find a small village bar showing the wedding on a tiny TV and managed to watch it from there. We’d decked out our boat in Union Jack bunting too. Quite a spectacle! These days we have friends who live near the canal and we like to have apéros by the water whenever we stay with them. When we lived in Paris we used to go to Reims regularly to visit friends who lived there and buy champagne. At least one time we made the effort to see the cathedral but bizarrely I can’t find any photos of the exterior. 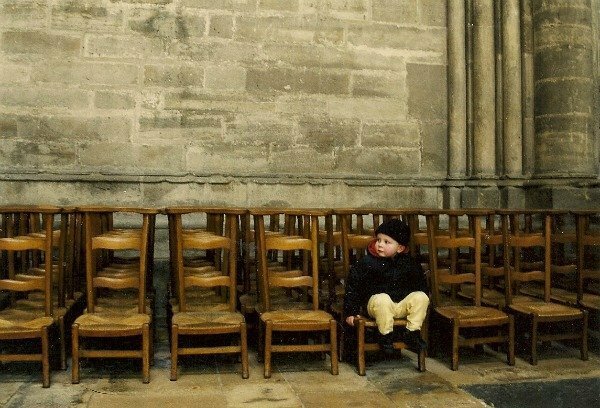 This is the (now) Teen aged about 2 sitting inside the great Cathedral, you’ll just have to take my word for it! 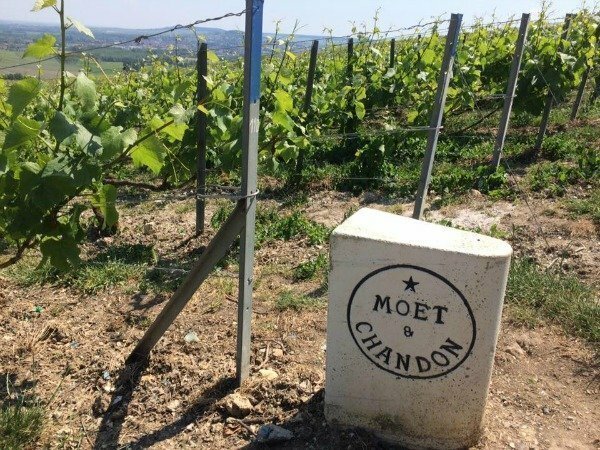 In conjunction with visiting friends in Reims and its Cathedral, we have often been to champagne houses, cellars and the vineyards themselves, though we’ve never been to the cellars of the big well known houses, only small independent producers. When we first moved south we missed our regular supplies of champagne from a particular house so much that we had it delivered, some 950 kms away! Those were the days…. Nowadays we buy from the local supermarket, how our standards have fallen! Vauban was a very prolific “fortifier” and living in France these days it’s pretty hard to miss his architecture. He built fortified towns, citadels and forts all over the country during the 17th century. 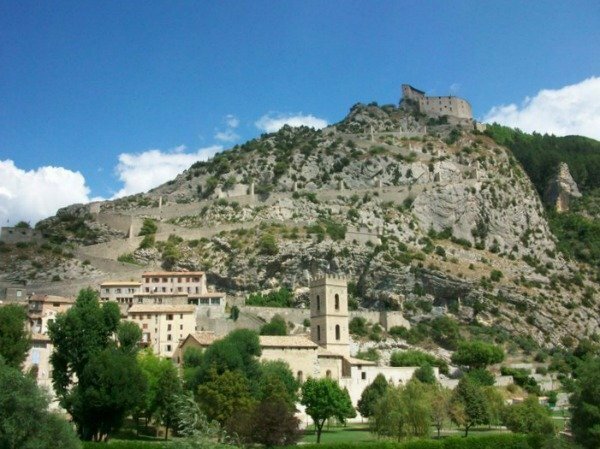 Some of our favourites are Entrevaux (photo), Colmar-des-Alpes and St Martin de Ré. Fort Carré in Antibes was redeveloped by Vauban and is the closest UNESCO site to Lou Messugo. We’d been to Avignon many years ago when we only had one kid so decided it was time to go back with the other one and explore some more. Last weekend we danced “sur le pont d’Avignon” (one way guaranteed NOT impress an 11 year old) and visited the Papal Palace (photo of both the bridge and Palace in the background 2nd from top). What a beautiful town! 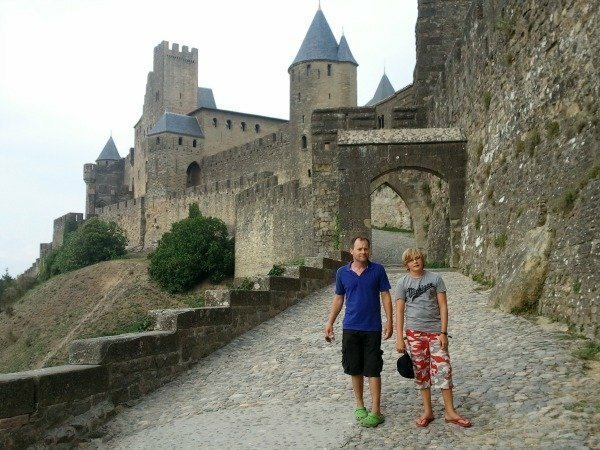 I visited Carcassonne as a kid during that holiday on the Canal du Midi, but it is the more recent visit with my boys that stands out. We stayed in a lovely B&B directly opposite the medieval walls with the most perfect view. At the time both our children were into knights and castles and you can’t really find a more impressive location to indulge this passion. Lyon is conveniently located exactly halfway between our current home in the Côte d’Azur and both Paris, our former home, and Nancy, JF’s hometown, so we have visited many times. We’ve stayed overnight with the kids several times and have tried to visit something of interest each time. I’ve also been to the incredible Fête des Lumières, its winter light festival. 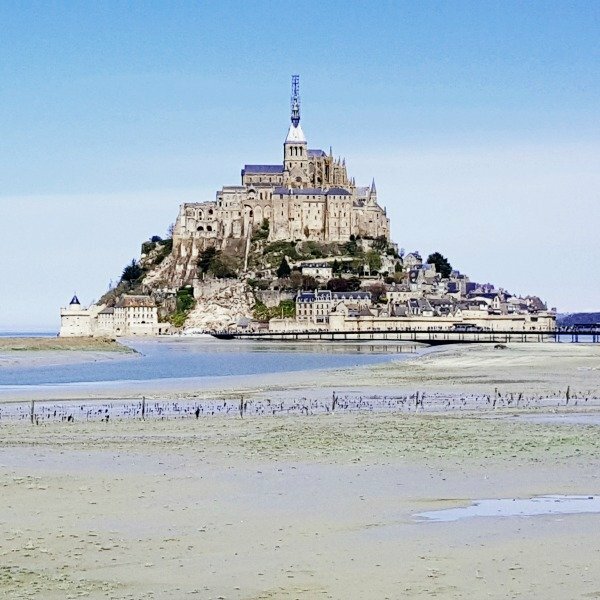 I first went to Mont St Michel on the most miserable of French exchanges in about 1985 in the pouring rain and wasn’t overly impressed, however, the second time was with the boys and JF, in perfect weather and a total revelation. In contrast to the mess of cars parked at the base all those years ago, the car park has been moved back a few kilometers and the almost exclusively pedestrian bridge has been designed to blend into the landscape revealing the splendour of the mount rising out of the bay without distraction. We all absolutely loved it. Fontainebleau is somewhere I feel I should know better, but have only been to the château once, pre-children, in the days when we lived in Paris. The surrounding forest, while not part of the UNESCO site is a great place for hiking and rock climbing. 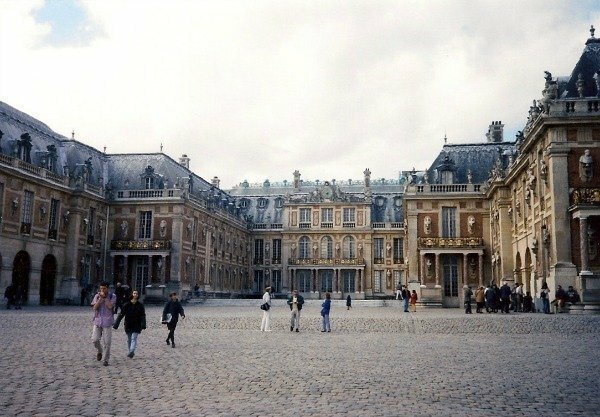 I first went to Versailles on a school trip aged 11, then again on my first ever holiday without parents, with 2 friends to celebrate the end of our O levels aged 16. Since then I’ve taken visiting relatives from Australia, but we’ve never been as a family with the boys. That’s definitely something that needs to be rectified on our next trip to Paris. Nancy is JF’s hometown which means we visit often. We had our wedding reception in the elegant Place Stanislas and posed for our disastrous professional wedding photos in Place de la Carrière. Disastrous because it was -8°c and I was so cold that I look completely frozen in the photos and not at all relaxed and happy! 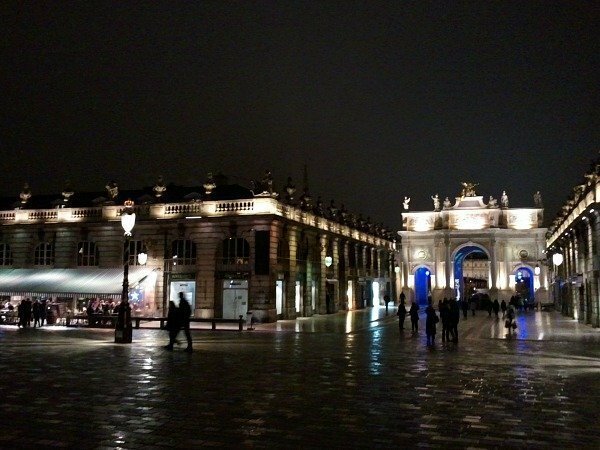 Nancy isn’t as well known internationally as it should be, it really is a beautiful city. The most recent of my France UNESCO visits; we have just spent a couple of days camping nearby with the little kid. 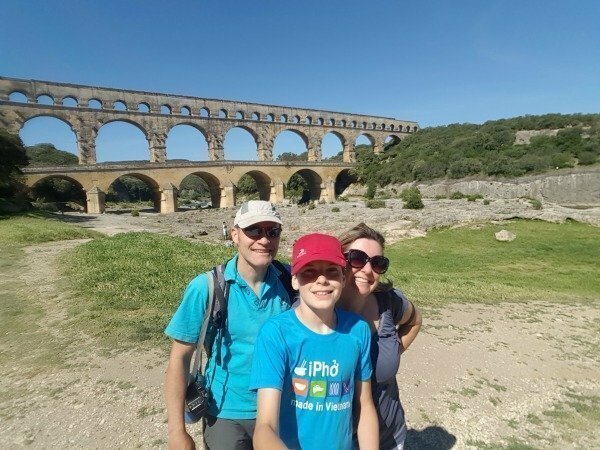 The aqueduct itself is an incredible feat of engineering and a phenomenal structure to contemplate, and together with its surroundings – the lovely river Gardon and “memories of the garrigue” park – it really is a very special place. Provins wasn’t so far from where we lived on the outskirts of Paris and I used to go with my mums and babies group sometimes for picnics. In this picture the (now) Teen is in his buggy aged about 18 months. Bizarrely, despite Strasbourg being only 2 hours’ drive from Nancy we’ve only visited once, for the famous Christmas market in rather poor weather. It’s gorgeous and I’d love to see it in the spring or summer. 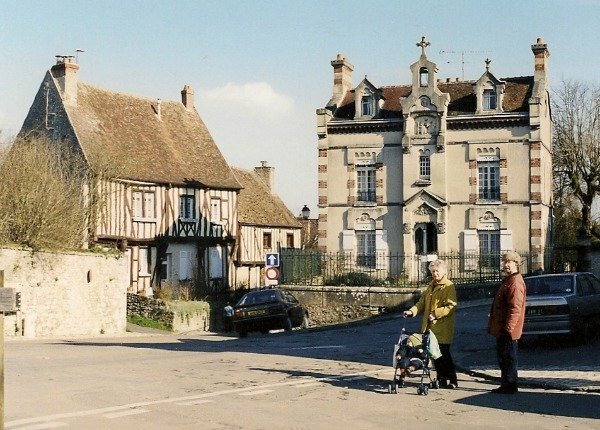 Burgundy is so centrally located for driving through and stopping over on long drives across the country that we’ve done just that too many times to count. During the great heatwave of summer 2003 we stayed in a hotel in the vineyards near Baune, the only criteria being a pool. We managed to tear ourselves away from the pool for long enough to visit the gorgeous Hospice of Baune, with its unusual colourful roof. 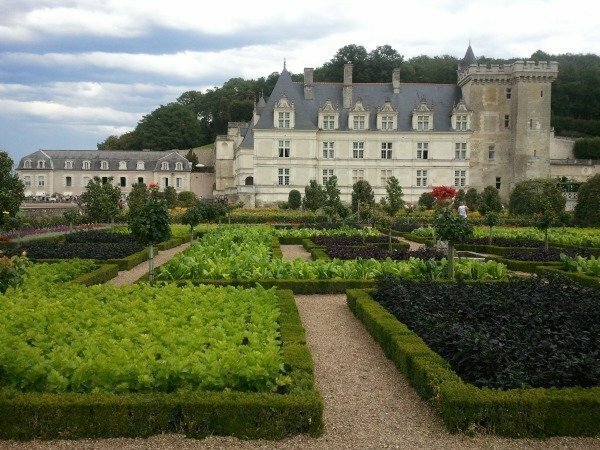 We’ve driven through the Loire Valley several times, stayed in Saumur and Durtal, and visited the Châteaux of Villandry (photo below) and Chenonceau (photo 3rd from top) with the kids. I’ve also been to a wedding years ago in Angers. However, there are so many amazing castles to explore in this area that we’ve really only scratched its surface. And the 3 I rather dubiously claim…. Le Havre is somewhere that I’ve driven through having arrived by ferry but have never properly explored. I put it on my “tentative” list. I can’t honestly say I’ve actually been up close to any of the mines, but having lived in Calais and Paris we’ve driven past countless times. The piles of scree stand out like pyramids and can be seen across the flat landscape from miles around and there’s even a dry ski slope on one! This is another one that’s a little tenuous… I’ve literally seen Le Corbusier’s Cité Radieuse in Marseille from the outside. I haven’t been inside or visited any other of his buildings…. For more information on any of these sites click through to the UNESCO World Heritage website here. So that’s it! There are another 19 to visit which should be achievable, all the while visiting sites in other countries too. By paying to visit these places we help fund further conservation, hopefully ensuring these wonderful heritage sites will be around for future generations to enjoy. Have you been to any of these places? Do you like “UNESCO World Heritage tourism” and if so which places are your favourites? I surprisingly have been to any of these places, but next time I’m in France I will have to! Great list you have, i’ll have to keep it in mind when I make my next trip out there! What a great list, and well done for visiting so many of these! I am ashamed to say that I can only actually remember visiting six of these, but apparently I have been to others – including Mont St.Michel and a couple of the cathedrals – when I was a child so maybe I could scrape double figures? Agree with you on Nancy – such a beautiful city! Conversely, I have never really warmed to Strasbourg; maybe time to give it a(nother) second chance? Been to quite a few of these. Would love to visit the Loire though. WOW – we have less than twenty UNESCO sites here in Canada, and a large number of them are actually national parks. We’ve got nothing on France!! Love UNESCO Sites! have been to most of them I guess over the years. thanks for sharin. Really loved reading this post Phoebe. The memories you’ve made visiting each place. Thank you for sharing on #citytripping and giving me some inspiration to add to my France travel list. Great minds think alike today! 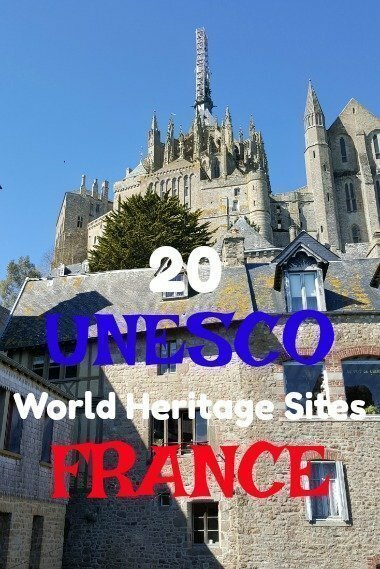 Some amazing UNESCO sites to visit in France! I have been to a few but still loads more to explore! 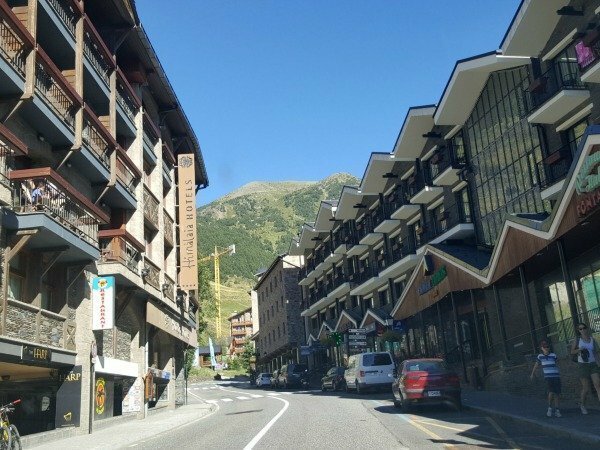 Isn’t France a beautiful country! I would love to live there again! All of these places and interesting on their own right. Need to explore more of France. I recently went to Strasbourg and loved it. I do not understand why people say the offer does not offers a lot. Ah, interesting that Mont St Michel’s changed. I probably last visited at around the same time as you, so I’m sure I’m due a re-visit. You’ve made me keen to go back to the Loire Valley, too – like you, we’ve only scratched the surface! Such a beautiful country to explore! I would absolutely love to visit any one of these places! Beautiful! I am a huge fan of UNESCO world heritage sites too, and I’ve ended up visiting a number without even realizing beforehand that they held that status, not many in France though! I hope you get to check off the other 19 and that you’ll write about them! Excellent post and one to keep handy for those that traveling to France. I’m happy to say that I’ve done most of those! 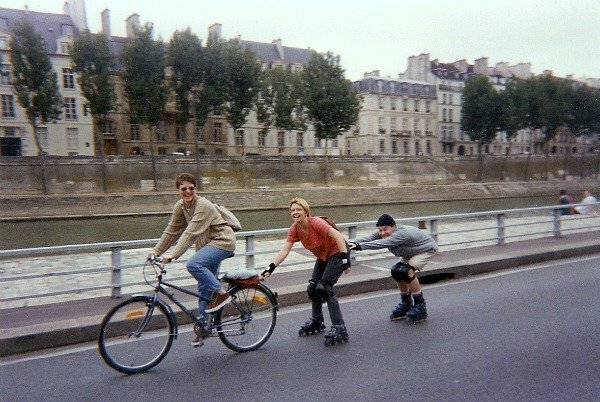 Phoebe, your photos and recollections bring back a lot of memories of some of our favorite road trips around France. 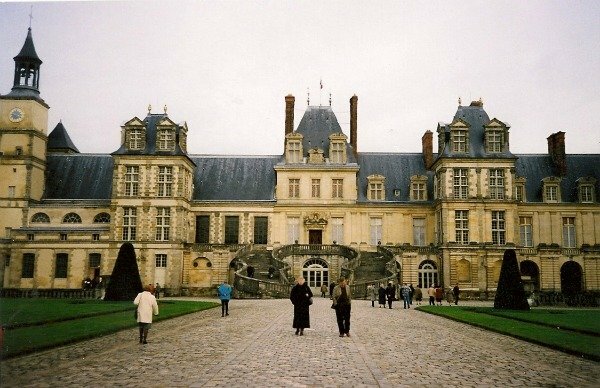 Of the places you mention, Lyon, Carcassonne, and the chateau at Fontainebleau are particular favorites. 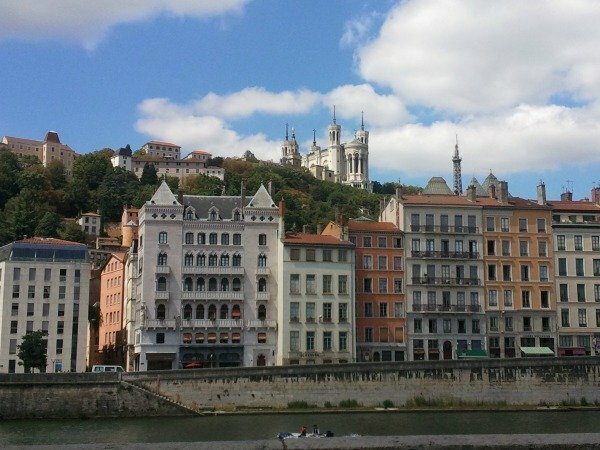 We’re especially fond of the UNESCO sites associated with the history of the Romans in France — one of the very best is at Vienne, just south of Lyon, but the theaters in Orange and Lyon are also worth the trip! Gosh, I didn’t realise there were so many in France. I have to admit that having lived in France for 7 years now, I’ve shamefully seen so little of it. I think it’s time to remedy that! Another great post! Since I first came to France, aged sixteen, I have only managed to visit about thirteen of these sites. Really must try to visit some more. 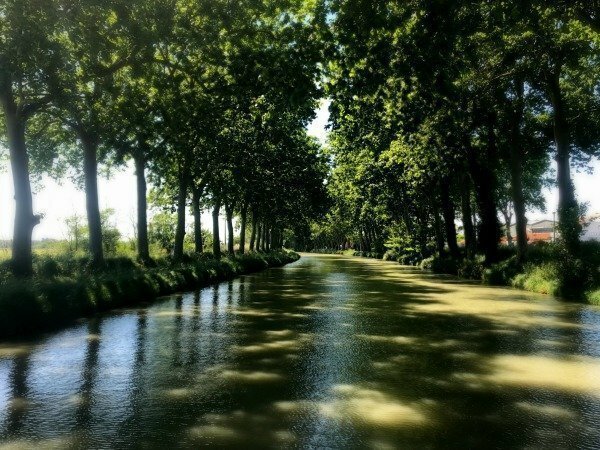 I feel so lucky to have the Canal du Midi at the end of our garden! 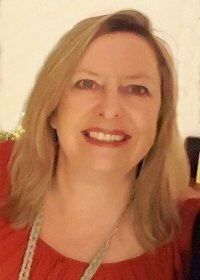 Thanks, too, for organising the link up. belfry in Calais! You are my inspiration for Le Corbusier Sally! Both spectacular and in the TOP 5 I’d say! Hilary, I even asked my parents if they could find photos of our canal holiday in 1981 which they did, but in the end they really were a bit too random and didn’t really illustrate either the canal or the decorated boat! Maybe I’ll use them for another post one day. I love that you factor in wine consumption…a logical thought for France! They are close enough to each other to do in the same trip. Go to both! I never remember to look the UNESCO list for a place until after I return. Need to change that. I have never counted to see how many I have been to. Good idea! Ooh I love finding places to visit using the UNESCO list, so this piece is basically my new dream travel list for one of my favourite countries in the world! I’ve sadly only visited a handful of these so far, but it’s so great to have something to aim for, including plenty that weren’t already on my radar (Vauban, Provins, the Climats, Place Stanlislas…these all look so wonderful). they have UNESCO World heritage status! This has reminded me that Canal du Midi and Carcassonne have been on my list for a while. Must get organised and go! Love your photo of your son in the Reims Cathedral. It is wicked how quickly time flies. Yes, have visited a few of these sites without always being aware of their UNESCO status. No opportunity for us to dance on the bridge in Avignon – too many people! Thanks for setting up the linky. 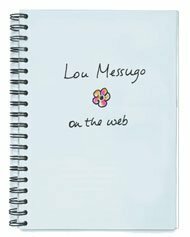 Looking forward to having a wander through the rest of the blogs. 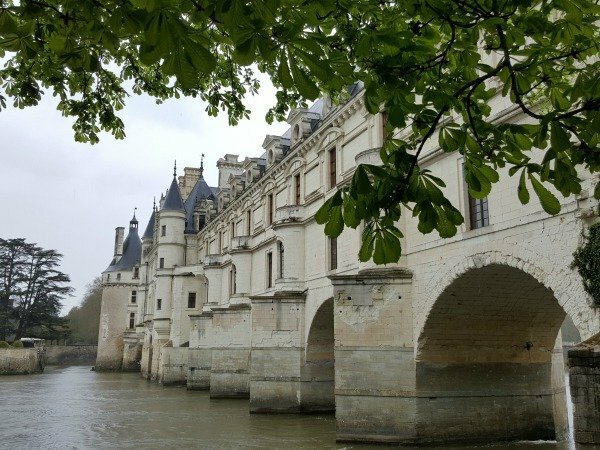 They are just extra photos to break up the text, not intended to have labels, but since you ask, the first one is on the pont d’Avignon looking towards the Papal Palace and you’re right about the second which is Chenonceau. Perhaps I’ll edit to make it clear where they are,. Excellent set of pictures and captions, though somehow the first two have lost their labels. The second is certainly Chenenceaux, but where is the first? Also Ch’eaux? I seem to remember hordes of snails, intended for lunch, escaping during the Charlie’n’Di wedding at Carcassonne.